When the Obama administration issued its landmark climate rule in 2015, officials declared that benefits to public health and the climate would be enormous — dwarfing the costs. For every dollar spent to comply with U.S. EPA's Clean Power Plan, the public could potentially get more than $6 in benefits, the Obama team said. Those benefits would come in part from averting premature deaths, asthma attacks and other health problems. Now, the Trump administration is poised to ax the rule, a move the president touted again Friday night at a rally in Huntsville, Ala. Of the Clean Power Plan, Trump said, "Did you see what I did to that? Boom, gone," according to CNN. But it's more complicated than that. As Trump's team formalizes its plans, officials are grappling with an important question: How will they change Obama's numbers to justify their plans? EPA pledged to take a second look at the cost-benefit assessment in April when it published a formal plan to review the Clean Power Plan. "EPA will assess this rule and alternative approaches to determine whether they will provide benefits that substantially exceed their costs," the administration said. That analysis will be important for several reasons. It will be used by the Trump administration to help convince the public and the courts that unraveling the rule makes sense for the economy. And it will send a signal about how the administration might recalculate climate change benefits and public health impacts more broadly when it's chopping down Obama-era rules. 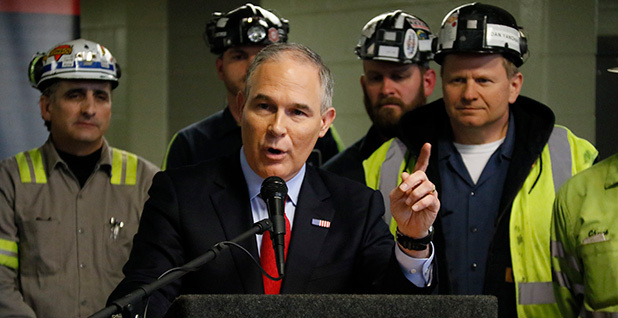 Observers close to the rollback expect EPA to release its proposal next week, before an Oct. 7 deadline by which the agency has to update a federal appeals court on its plans. Many are expecting the agency to solicit comment on a drastically scaled-back version of the rule. They're also expecting EPA to release an overhauled look at the costs of the Obama-era regulation that has been recalculated to show a higher price tag and smaller benefits. "I expect them to use fuzzy math, for sure, to lower the benefits and increase the costs," said Alison Cassady, director of energy and environment policy at the Center for American Progress. Tom Lorenzen, an attorney at Crowell & Moring LLP who represents groups challenging the rule in court, said there's nothing surprising about the overhaul. "Agencies are entitled to look at the facts again and determine if they think about things a different way," he said. EPA spokeswoman Liz Bowman declined to comment on the administration's plan because it is in the interagency review process. The aim of the Clean Power Plan is to slash the power sector's greenhouse gas emissions 32 percent below 2005 levels by 2030. By the Obama EPA's estimate, the health and climate benefits would be $34 billion to $54 billion annually in 2030. The costs would be about $8.4 billion per year. Critics of the Clean Power Plan have long decried the Obama administration's calculations — saying those numbers vastly overstated the benefits while underplaying the costs of the rule on industries and consumers. Their arguments offer some options for how the Trump administration might reverse course. One likely approach: Say Obama underestimated costs. An industry analysis issued shortly after the Obama rule was issued predicted that the Clean Power Plan would be exponentially more expensive than expected — with annual costs ranging from $29 billion to $39 billion between 2022 and 2033. That report, by NERA Economic Consulting, was prepared for coal lobbying group the American Coalition for Clean Coal Electricity (Greenwire, Nov. 9, 2015). Contrary to Obama EPA's claims that electricity costs would drop for consumers, the report from NERA Economic Consulting also predicted the rule would raise electricity prices across the country. EPA Administrator Scott Pruitt paid attention to that report. In May, he cited figures from the NERA study, saying the rule would have a total cost of $292 billion (Climatewire, May 25). Also expected: a reduction in the benefits. One avenue for doing so would be to reconsider the social cost of carbon, a complex metric for determining the cost of damages from emitting the greenhouse gas. "My guess is they're going to try to make it as close to zero as possible," said Cassady of the Center for American Progress. The Trump administration has already sought to eliminate the social cost of carbon value used under the Obama administration through an executive order, but has left room for agencies to recalculate the value based on domestic — rather than global — emissions. This move would mean that the calculated benefits of avoiding carbon emissions would be much lower, and so the economic benefits of implementing the regulation would be significantly diminished. In the case of the Clean Power Plan, using a much lower value for the social cost of carbon could eliminate nearly half of the benefits of the climate rule, according to Richard Newell, president of Resources for the Future (Climatewire, Feb. 13). The Obama EPA said climate benefits accounted for $20 billion of the estimated total. Pat Parenteau, a professor at Vermont Law School, said he wouldn't be surprised if the Trump administration took the position that the social cost of carbon is "too speculative." He said that "they may try to say it's just impossible to put a real, reliable number on the social cost of carbon, so we're not going to do it." Proponents of the rule warn that such an approach would have a tough time in court. "The courts have consistently struck down agency reviews that don't account for climate impacts," said Michael Burger, executive director of the Sabin Center for Climate Change Law at Columbia Law School. Another avenue for the Trump team would be to scrap any consideration of how the rule might cut emissions of other pollutants, which are not directly targeted by the regulations. That produces a wealth of co-benefits under the Obama calculations. A huge chunk of the predicted benefits comes from slashing soot- and smog-forming pollutants also emitted by the power sector. Those can cause health problems like premature deaths and asthma attacks. The issue of co-benefits is a hot topic of debate among environmental lawyers, who will be closely watching the Trump team's calculations. "It's basically an unresolved legal question," said Burger. Supreme Court Chief Justice John Roberts in 2015 raised concerns during oral arguments over a separate Obama air rule, suggesting that counting the benefits from eliminating a pollutant that wasn't the direct target of the regulation might be "illegitimate" (Greenwire, July 1, 2015). The Trump administration's about-face on the economics of Obama's Clean Water Rule could offer signals about its strategy for unraveling the Clean Power Plan. In June, EPA and the Army Corps of Engineers challenged their own analysis of the 2015 water regulation, saying most of the benefits they previously ascribed could no longer be quantified (Greenwire, July 7). The new economic analysis — released alongside a proposed repeal of the water rule — kept the previously calculated costs of imposing the rule but slashed the perceived benefits by 85 to 90 percent. That meant the benefits no longer outweighed the costs, as they did in the Obama-era assessment. While the agencies said in 2014 that the water rule would result in benefits of up to $554.9 million in increased wetlands protection, this year's assessment said those benefits were "unquantified." To explain the discrepancy, the Trump team said faulty data had been used. "[T]he agencies believe the cumulative uncertainty in this context is too large."